Finely detailed wedding coach made of gold. Historical paintings in the State room of the town hall served as inspiration for the great pageant. Landshut in lower Bavaria. The town hall is in the heart of Landshut. The state-room is the “showpiece”. A must for all guided tours of Landshut. Here we find the roots of one of the most outstanding pageants Europe can offer. 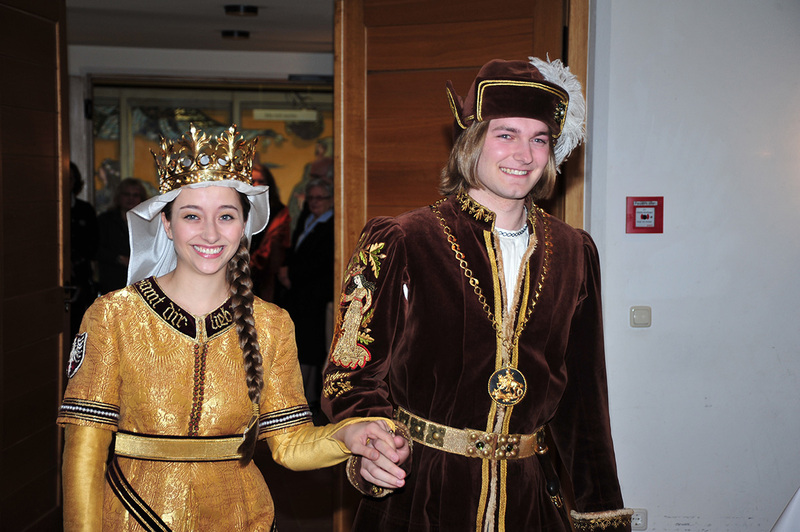 The “Landshuter Hochzeit.” The Royal Wedding of Landshut. Our story starts with a series of paintings on the walls of the state-room in Landshut’s town hall. The Duke’s mounted heralds. Fanfare blowers,trumpeters, noble ladies of court throwing flowers to the spectators, and crowds of astounded onlookers.Flag and standard bearers in a festive procession, Knights in shining armour, the emperor with crown and cepter, the loud jingle of the court jester dressed in bright red! Under a deis, the church elders with mitre and staff. Noble guests dressed in silk and velvet. A perfectly groomed team of horses with long flowing mains pulling the golden wedding coach. 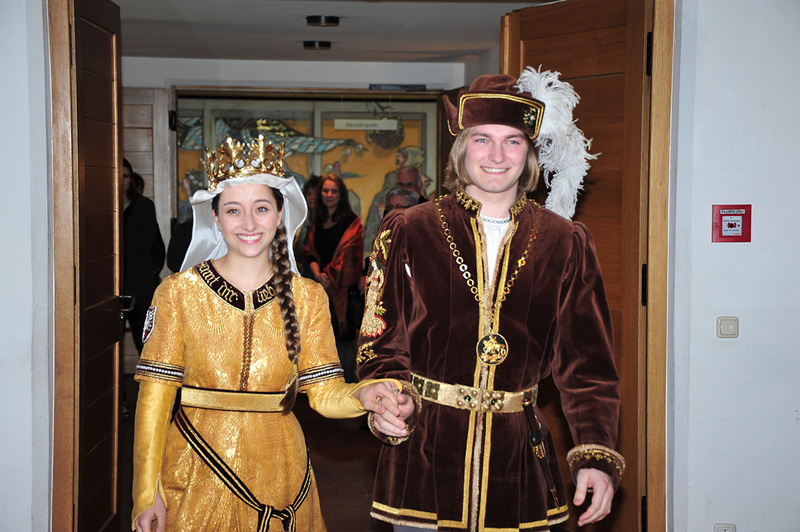 The young duke on his firey black steed, at his side the future bride,as they near church of St. Martin where the archbishop of Salzburg is waiting to “unite” them. This then is the colourful description from Hans Thoma, who describes the procesion scenes in the paintings at the town hall. The chronicles of the “Patrons Association” confirm that the distinguished citizens Georg Tippel and Josef Linnbrunner joined to form and establish an organisation in 1902, which would indeed serve to realise the scenes in the town hall paintings. 145 costumes were made and financed from private cotributions. Landshut’s town hall originally consisted of three buildings. Three gothic gables which looked down on the Old Town. The facade was rebuilt in 1860 in neo-gothic style. The state-room, which is on the upper floor of the centre building already existed in the Middle Ages, and was decorated in the style of that period.From 1862 the interior of the town hall was also to undergo modernisation. In 1876, the architect Georg Hauberisser was commisioned to give the state-room a neo gothic style. There was indeed a long discussion about the new frescos, and what they should depict. Finally, the Magistrate decided the only fitting solution could be the portrayal of the proudest moment in Landhut’s history. The Munich Court Painters August Spiess, Rudolph Seitz, Ludwig Löfftz and Konrad Weigand were commisioned to paint a series of pictures which would depict the “Landshuter Hochzeit” of 1475.